It always amazes me how close you can get to wildlife. These two beautiful ducks must be looking for somewhere to build a nest ready for thei ducklings. 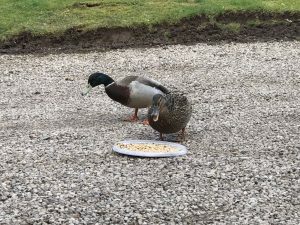 Since I took this picture they have been back many times for a little bit of breakfast. I hope in return they will bring some of their ducklings to see me, when the time comes. I often see red squirrels, but I still get excited, as do all my family, but I know so many people are not so lucky to be able to watch these gorgeous little creatures from their windows every day as I can. This photo was taken from Lacet Cottage on a changeover day. Luckily I had my phone to hand so I could take some pictures. I also got a video but unfotunately I can’t upload such a large file on to this site, but if you would like to have a look then go to huttonjohnestates instagram and you can watch it there. 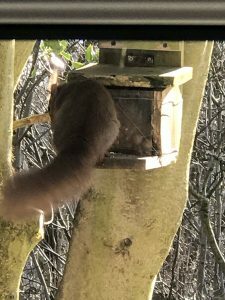 We must do our best to protect these native breeds and that is why I provide bird food and red squirrel feed for guests to feed the wildlife, if they like to do so. Thankfully most people do and that is why the birds and the squirrels keep coming back. The squirrels particularly love the hazlenuts but at £7 per kilogram I mix them up with other less expensive nuts! Now that I think Spring has finally arrived I am looking forward to seeing lots more wildlife in the garden and beyond.